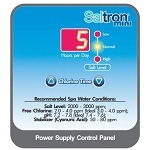 The Solaxx Saltron Mini Salt Chlorine Generator is such an easy way to convert your spa or hot tub to salt water and maintenance free bliss. Featuring an adjustable digital timer this unit allows you to be in control of how much chlorine it produces. 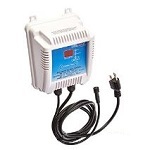 It comes with a control unit that can be mounted on any close-by wall (note that you will need a GFCI grounded outlet for the control unit) and the cell unit itself which needs to be dropped into the spa or hot tub about one foot below the surface of the water. Check out the Amazon Reviews on this unit! People are raving about this product and how easy it is to convert their spas/hot tubs to salt water and how clear and fresh the water is. This unit works independently from the spa filter and pump system so it is not relying on another system for operation. The control unit has LED indicator lights for easy salt level reference which allows you to determine quickly if you need to add salt. The cell is low maintenance with a reverse polarity function that keeps the cell clean and reduces build up of minerals on the plates. As with it’s big brothers, the cell should be checked periodically (the manufacturer recommends every 3 months) for calcium/mineral build up and if so, cleaned in a muriatic acid solution (Solaxx recommends 80% water and 20% muriatic acid) in a bucket. The Solaxx Saltron Mini is so simple to use and installation is pretty much a non-event. 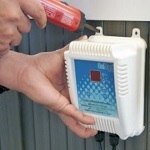 After adding salt to the spa, plug the unit in, drop the chlorinator cell into the water and turn it on. Set the number of hours per day you want it to run for and that’s all. During the first few weeks you’ll need to measure the chlorine level in the spa and adjust operational hours accordingly until you get it right as the amount of chlorine produced is based on the number of hours the chlorinator is run for. The unit comes with a cradle for the chlorinator cell which you can mount on the outside of the spa. It’s recommended that you put the cell in its cradle when the spa is in use. The control unit can be wall mounted and it is recommended to mount it in a convenient location. The Solaxx Saltron Mini is smart enough to know when the chlorinator cell is not in water and will automatically switch itself off. The warranty on the Solaxx Saltron Mini is 1 year. Given the price of this unit, we think that’s not too bad. By keeping the operating environment healthy and looking after your unit (ensure salt levels are within limits, and water temperature is also within limits) and your unit should give you years of faithful operation. 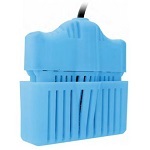 This unit is suitable for spas and hot tubs up to 2,000 gallons.